Mumbai: For small and medium enterprises (SMEs), this is clearly the year of initial share sales. 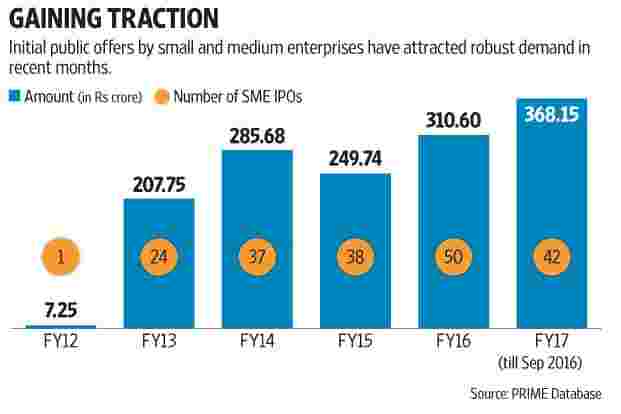 In just the first six months of 2016-17, SMEs have already raised Rs368.15 crore through initial public offers (IPOs), more than in any full financial year, data from primary market tracker Prime Database shows. In the previous financial year, SMEs collectively raised Rs310 crore through IPOs. SME IPOs have attracted robust demand in recent months. The Rs2.8 crore IPO of DRA Consultants Ltd was oversubscribed 12.84 times. Valiant Organics Ltd garnered orders for more than five times the Rs22 crore of stock it offered investors. “Overall, the secondary markets are also doing very well. The primary markets usually shadow the secondary market. SMEs are also in the market to tap funds, as the time seems just right," said Shripal Shah, promoter and director of Aryaman Financial Services Ltd, a merchant banker to around 22 SME IPOs. Indian companies are expected to raise over $5.8 billion this year through IPOs, double the amount they raised last year. According to data released by Baker and McKenzie, a global law firm, IPOs in India will hit a six-year high in 2016. Some $2.93 billion has already been raised via initial share sales and $2.9 billion of IPOs are in the pipeline, according to data compiled until 22 September. Key upcoming IPOs include share sales by telecom company Vodafone India Ltd and insurance company SBI Life Insurance Co. Ltd.
Shah pointed that the large returns delivered by SME IPOs have attracted investor interest. The BSE SME IPO index was launched on 14 December 2012 at a base level of 100. Since then, it has multiplied more than 10 times to 1,007.62 points. Both BSE Ltd and National Stock Exchange of India Ltd (NSE) launched their SME platforms in 2012. SMEs are small companies often in the early growth stages. Some have the potential to deliver high returns although some others carry a high risk of failure. Investments in these companies are ideally for investors who can stomach significant risk. “In the case of Valiant Organics IPO, we had mutual fund investment coming from Reliance Mutual Fund. That is a new thing. Prior to this, institutional investors were not actively participating... in these IPOs," said Shah of Aryaman. While investors primarily comprise high net-worth individuals (HNIs), institutions have been showing some interest in SMEs lately. There is still some way to go before institutions look at such offering closely. “Primarily, HNIs are the main investors. It’s a positive sign that institutional investors are looking at it on a selective basis. SMEs are eventually the growth engine of India If they start receiving funding from institutions, it will be a very encouraging sign," said Pranav Haldea, managing director of Prime Database, a primary market data tracker. “Institutions can only invest if they have a mandate to it. Very few funds would be eligible for it currently," added Haldea.